You always hear that thinking positive thoughts and eating a good diet will do good things for your body. I was working with a chemist to create these illustrations, and I learned why this is physiologically true. Many different elements go into our cells. 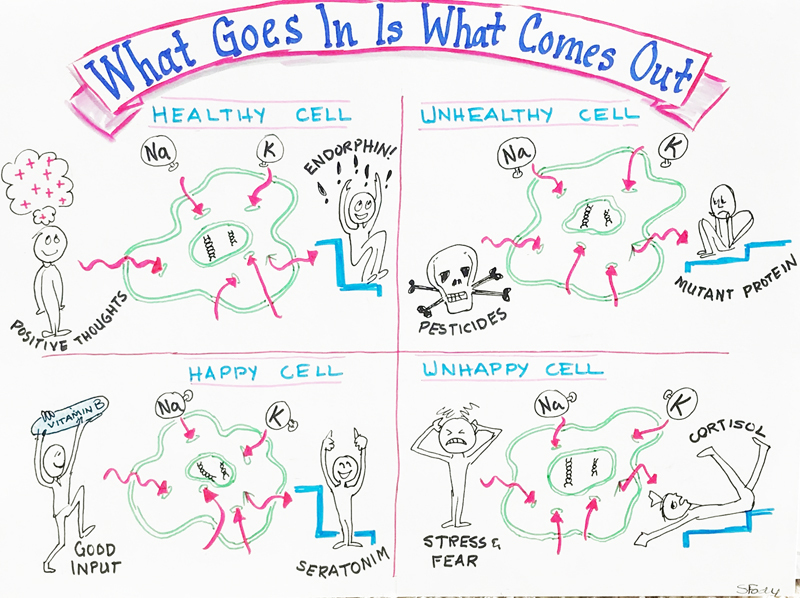 Looking at the healthy and happy cells in the graphic, we see that we do have much control over our health. Stressing and exposing yourself to harmful chemicals produce undesirable outputs. Concepts that are difficult to explain are so much easier to see when they are illustrated. Think about your situations. Do you have complexities – perhaps like financial concepts, scientific explanations or processes that your workforce or audience just doesn’t ‘get’ so easily? Use a graphic format to communicate with ease! Contact me to learn how to make your message clear.